There is absolutely no need to have your kitty declawed for the sake of protecting your furniture. A declawed cat is left almost defenseless and it is a cruel and barbaric practice. Remember though that a scratching post is not a replacement for feline pedicures. Kitty’s nails still need to be trimmed carefully. Cats NEED to scratch, as it is the process whereby they remove the outer sheath (dead layer of nail). Have a look around the scratching post and you will find those discarded sheaths. Do not be alarmed! If cats aren’t allowed to scratch and remove the outer sheaths, they could resort to chewing their paws and this could lead to cuticle problems. So where is a good place for kitty to scratch? A Scratching post, of course! Not only is it necessary for their nails, but it is also a therapeutic tool for natural feline behavior to stretch the back and muscles. Therefore, it is recommended to invest in a scratching post that is taller than the height of your kitty, so they can reach up while scratching. If you don’t supply kitty with a scratching post, she will find other items to use, like the beautiful and expensive sofa. No matter how hard you try to dissuade her from using it, she will just find another item of furniture or carpet, or worse still … she will wait until you are not around and continue her behavior. So, now you have supplied kitty with a scratching post and she still continues to scratch at the sofa or undesirable places. Do not use negative behavior training but instead make the furniture unappealing to her. Cover her favorite spot with self-adhesive paper. It will not suit the rest of your interior but it is only for the duration of the good behavior training. Place her scratching post near the now-taboo favorite spot and take kitty to it. Use your own fingers to scratch the post and make sounds of enjoyment. Do NOT drag kitty’s paws up and down the post! She will soon copy you and realize that the new scratching post is much better than the sofa. Once kitty is used to the scratching post, you can gradually move it to a position where you would like it, a small distance each day so that you don’t confuse kitty again. Don’t place the scratching post in a room that is hardly used or where kitty will feel lonely. She will like it to be near enough her human companions where she can feel included. Once kitty is only using the scratching post, you can remove the self-adhesive tape from the taboo places. It is highly recommended that you have as many scratching posts as you have space for. They don’t all need to be big and take up too much space. A smaller one close to her food and water bowls is ideal. One by the back- or front door will be greatly appreciated. They don’t all have to be traditional scratching posts! A simple and economical scratching post could be some sisal rope tightly wrapped around the dining room table leg, or you could wrap some sisal rope around a narrow piece of wood and jam it at an angle against a door. A horizontal scratchpad is also recommended for those cats that enjoy scratching carpets rather than stretching up a post. In that case, make sure that the base is heavy and covered with a very rough carpet, unlike any of that in your house. Although not aesthetically pleasing, you could cover an old wooden stepladder with sisal rope and rough carpet. Construct some hammocks between the rungs and you have a cheap kitty-condo! When choosing a scratching post, choose the roughest looking carpet! Don’t think that kitty would want to scratch on a soft, fluffy carpet! The best description I ever heard was that you should compare the texture of the carpet to a human nail file. The rougher, the better it will work! They really want to sink the claws into the material and pull and stretch! You also want to discourage them from scratching and pulling on any kind of carpeting or upholstery you have in your home. Make your own scratching post! Even if you are not a good do-it-yourself-er and have more thumbs than fingers, it is much easier than you think! Here is a very simple, basic scratching post that you can start off with and as you go along, you will plan your next DIY scratching post with more enthusiasm and ideas … eventually you will be able, and want to, make a beautiful cat tree house or kitty condo! 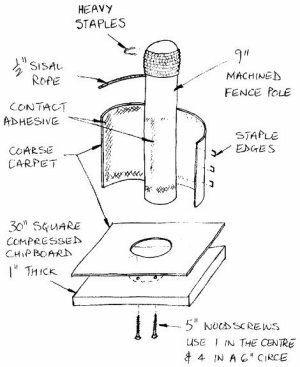 Be sure to screw the post to the base plate with at least four countersunk screws and make sure that the post is stable. You would not want kitty to topple it over! Remember, the thicker your post, the wider and thicker the base plate to ensure stability! If you want to cover the base plate with carpet then I suggest you do this before hand. I also found it much easier to to roll the sisal rope onto the pole before fastening it to the base plate. When using sisal rope in sections on the post, first glue your carpet down and staple the side seams. Remember to pull the sisal rope as tight as possible and I recommend doing two rows at a time, hammering it down real tight. You will be surprised to see how the cats pull it lower with time, leaving an open gap between the rope and carpet! Secure the ends of the sisal rope with a heavy staple. Once you have had some practice, have a look around and get some ideas for making a kitty jungle gym. The ones shown here, are a lot of fun to make, and very cheap. Collect cardboard tubing of different diameters and covered it with the cheapest carpet you could find. Off-cut pieces of flat wood were turned into base plates and shelves. Small plastic wastepaper baskets (with the bottom cut out) make cozy tunnels. You could even cut out the bottom of a bin, cut it in half and have a sturdy hammock! Once you have the various tubes and tunnels on hand, loosely construct a gym and see where you can improvise. Sometimes it to be the most fun to design and build as you go along!